Casual, multi-regional Spanish tapas restaurant and bar. Happy Hour at Bar Mercado! Enjoy a complimentary chef's choice tapa with every beverage purchase! 5-7pm, Tuesday-Friday at Bar Mercado. I went for lunch on sunday @1.45pm. It was disappointing that they only had a limited brunch menu. I had seen different interesting food items on the open table album that I was looking to try. Limited paid parking available across the street. GjOmoba, Thank you for dining with us at Bar Mercado. On Sunday's we offer brunch until 3pm followed by our traditional dinner menu. We apologize for the confusion. We hope we have the opportunity to serve you again in the future to share more of our menu with you! Wonderful brunch to celebrate our first anniversary! We ordered the fried artichoke (delicious! ), the banana bread (the only thing we thought didn’t quite live up to the rest but still tasty), the salad, the hangar steak, and the Benedict (my favorite!). They also brought us cheesecake to celebrate which was obviously house made and yummy - not too sweet. We will definitely be back to try to the regular menu. Thank you for dining with us for such a special occasion! We look forward to welcoming you back for dinner soon! Thank you for dining at Bar Mercado! Loved this restaurant! It was so cute and all the staff helped each other out even if it wasn’t their table. Our drinks were never empty! It was a great experience and we will be back. 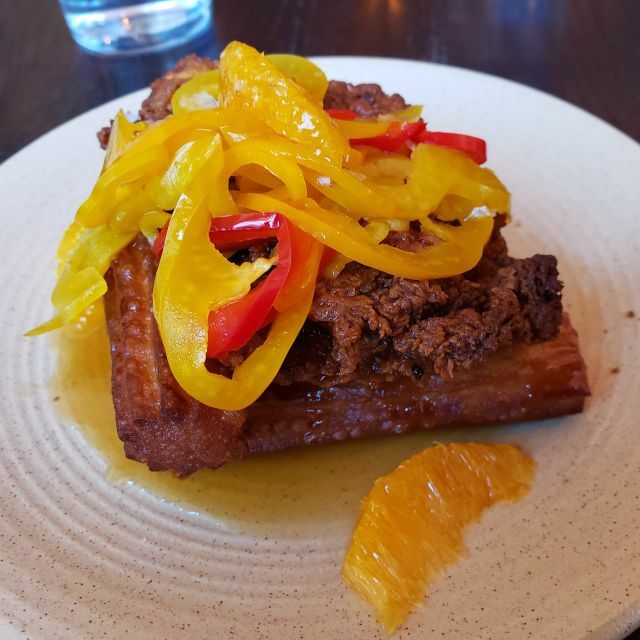 Thank you for dining with us devondanielle! Did bday brunch for my sister - our server was amazing! Byron I think? He was great. The food was expensive for the portions. Thank you for celebrating with us Claire! I’ve been coming since day one, and I’ve never had a problem before. In fact, this was my favorite restaurant. This visit was like walking into a completely different restaurant. The service was poor, it looked like everyone was miserable. 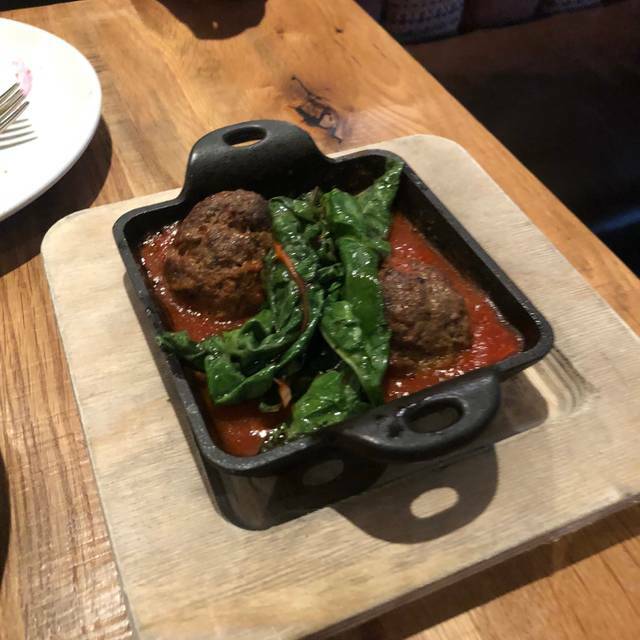 The food was nowhere near the quality I had become accustomed to, it seemed like the idea was to cut corners instead of provide quality product. It was also my birthday and while noted on the reservation, and mentioned to the server, there was no recognition of it. We’ve always done birthdays and anniversaries here. No more. I will also stop recommending bar Mercado to people. It’s hard to believe this is part of CHG.
Nice shared dinner for large family group. The fried artichokes and salmon were particularly good. The servings were small for the prices. Our waitress was very attentive and made good suggestions. Delicious food, great service, and lots of character! 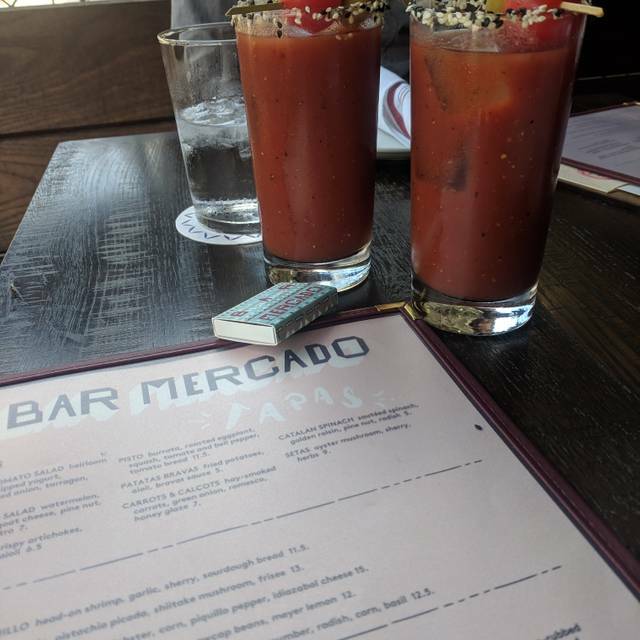 I definitely recommend Bar Mercado if you’re looking for a brunch spot in Atlanta! Thank you for dining at Bar Mercado LaurenT! Food here is always great. Glad I found this place; makes for a great date night. Thank you TavorisC! Thanks for sharing such a special evening with us. 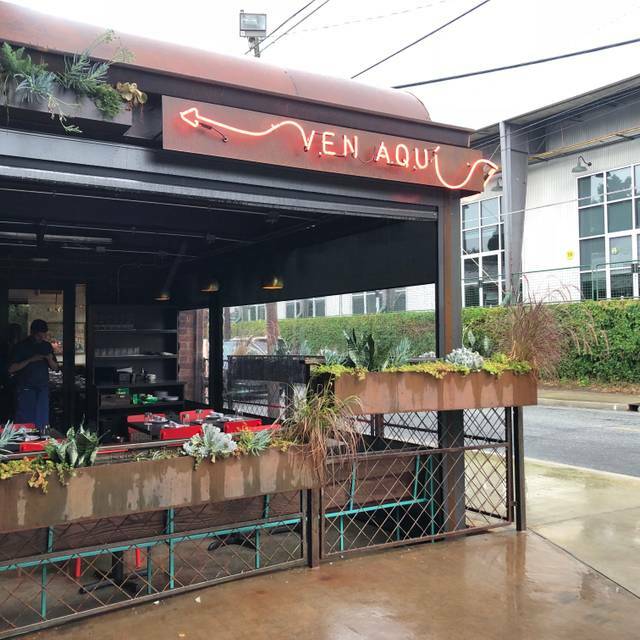 I went to Bar Mercado for the first time during Inman Park Restaurant Week. It was a great way to get to know the menu and everything was delicious! A great place to sit outside and people watch at Krog. You must get the Bikini! Thank you for joining us during Inman Park Restaurant Week! We hope to welcome you back soon! Bar Mercado is a really cool place for time with friends with a nice patio seating area. The bottomless mimosas had way to much juice but was advised at the end that we should have gotten the sangria. People who sat next to us said that we should be able to swap out but our waiter denied that request. i decided to have the saland with lobster which was not bad but my cousin had the shrimp and grits, she stated that the shrimp was very bland. For the price it should have been a better experience. The main reason why I don’t plan to return is due to the service provided. My waiter did not let us know of the specials prior to ordering which means I would have chosen the 1/2 off off wine special instead of bottomless mimosas. Found out after the waitress for the table next to me stated it. By this time I guess it was too late to change because she said that she will mentioned it to our waiter and he returned without even acknowledging it. Also we were enjoying our conversation and since the mimosas were full of juice we did not feel as if we weren’t sipping champagne during our two hour visit. But what really did it for me is when our waiter advised us that his shift had ended and that we basically need to close out our bill. His exact words were that is your last glass (if you see menu or website there is no end time) but my waiter definitely cut me off of my wonderful spiked juice haha. Mind you we just decided to order dessert and a bottle. Needless to say I was pretty disappointed. Oh the other waitress did try to help by bringing us better mimosas. DenetreisS - thank you for sharing this feedback about your experience at Bar Mercado. We are disappointed to read that the experience did not meet your expectations. We would appreciate the opportunity to connect so we can ensure this isn't your lasting impression of our restaurant. Please let me know if you would be willing to share your email address. Thank you! enjoy the beautiful view and weather!! Thank you! We will be back!! SusanC - thank you for sharing this special occasion with us at Bar Mercado! Our party of four cousins had a wonderful time catching up, laughing and enjoying the perfect early spring weather on the patio. It was a bit chilly when we arrived and the hostess was very accommodating switching on the heaters for a few minutes to take the chill off. The atmosphere was understated and interesting--I loved the bathroom wallpaper and the large tapestry at the entrance. Our waiter Nate was great, taking care of everything quickly and efficiently...very cute and charming without being overly talkative or in our faces. He did a good job making suggestions and helping us with the menu. The food was well prepared, imaginative and of good quality. Don't miss the fried artichokes and the banana bread. I had a gin cocktail called Tomato King that was wonderful but the name is misleading. It was an unusual combination of watermelon, tomato, lemon, agave and basil. 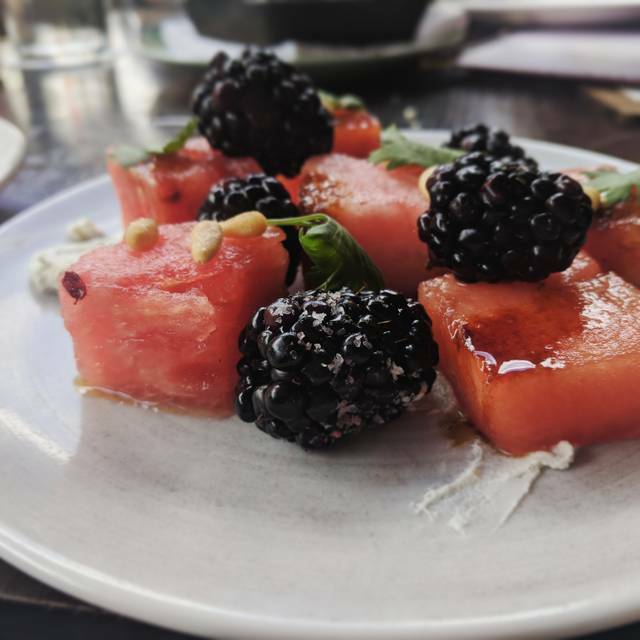 I took a risk picking Bar Mercado and was a little worried it might be too hip for our group of older ladies but everyone was very friendly, from the other patrons to the owner and all the staff, making it an absolutely perfect dining experience. 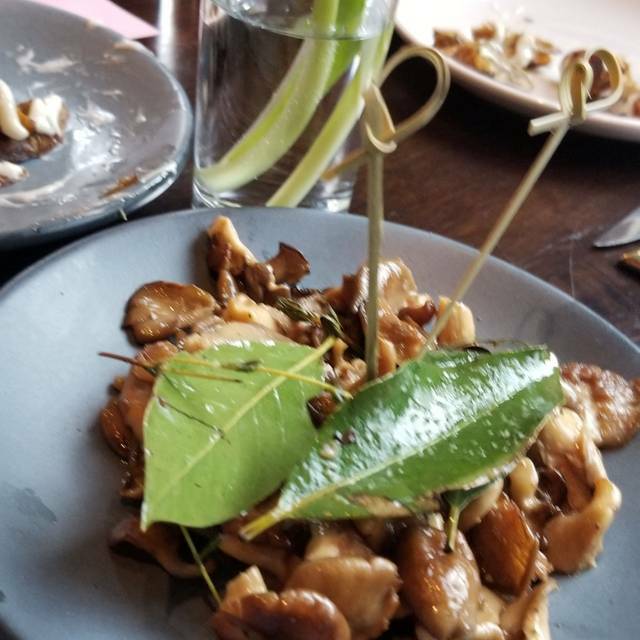 SherryC - thank you for sharing this special meal with us at Bar Mercado. It was our pleasure to serve you! The food was amazing and not super expensive for a small/multi-plate tapas style place! 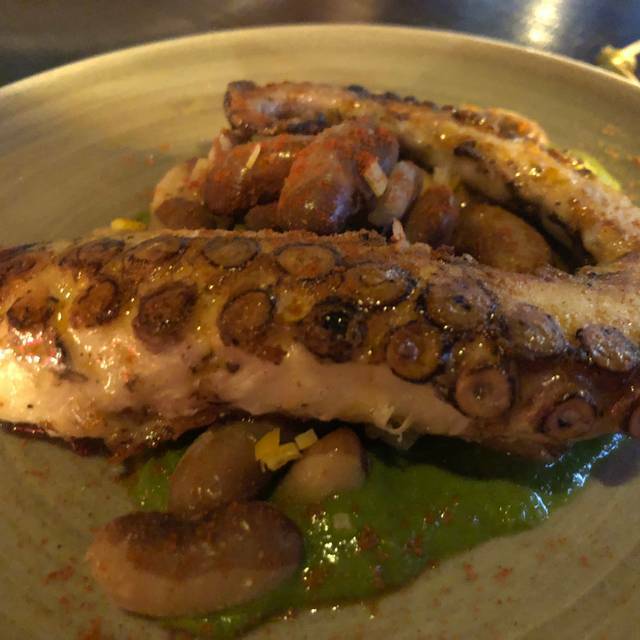 Thank you for dining at Bar Mercado AileenR! AdrianA - thank you for dining with us at Bar Mercado! It's great to know you enjoyed the experience and we look forward to welcoming you back soon! This was my first time at Bar Mercado and I really liked the vibe, the energy and the overall setting. I am a big fan of Spanish tapas since they usually offer bright and complex flavors. With four people, this would give us a chance to sample a few of the dishes. There were two outstanding vegetable options. The ARTICHOKES were lightly salted, perfectly crisped and offered great flavor and textural contrast. I rate this dish a 10. The second outstanding choice was the SETAS. The sherry/mushrooms combination at BM was fantastic. The addition of sprigs of thyme added more complexity to the dish I loved these two choices and give this dish a 10+. Less to my liking was the PISTO, best described as a stew with chunks of vegetables in a rich tomato sauce. The sauce completely overwhelmed all the other components to the point, other than the Brussels sprouts, none were distinguishable. I can only give this dish a 4. We also ordered two of the larger seafood plates. The LOBSTER PAELLA was very good but contained very little lobster meat; I did notice one claw. The rice was cooked with some offering a little crunch on the outside (it is supposed to) and there was a good rich flavor. I would rate this an 8. The bad news was the last dish and how the server handled the situation. The GAMBAS AL AJILLO was inedible and the two of us who took a bit of the shrimp both stopped eating them. They were mushy and very fishy, I would venture they were borderline rancid. When the server came over I told her, “the shrimp are bad, they are mushy and fishy and you should tell the chef to check them since I think they may be rancid.” She thanked me, yet they remained on the bill, bad job server. Rate both a ZERO. Overall, we had a great time at Bar Mercado. We will definitely return, choose some of our favorites from this visit and try others. Most of the dishes were excellent, but the server, while friendly, did not handle the issue with the shrimp properly. JeffS, Thank you for sharing such thoughtful feedback and for the honesty about the issue with the gambas (shrimp) dish. Please accept our apologies for not removing the item from your bill - it was our intentional and clearly was missed. Would you please let me know if we can connect so we can remedy this for you? Great service and delicious food from beginning to end. Thank you FianmyT! It was our pleasure to serve you. Excellent, well-thought out menu. Wonderful staff. LeilaR - we are excited to read that you enjoyed our menu and our service. We hope to welcome you back soon! Excellent food and service, would highly recommend for anyone. The waitress even brought us additional cheese on our cheese board when she noticed we were not enjoying the bleu cheese option. Thank you for dining with us ChrisW! We enjoyed the opportunity to serve you. Bar Mercado was great for my large party. Our waitress was attentive and constantly at the table. Thank you MFrimps! Thank you for sharing the evening with us. Service was great. Food was above average. Cocktails were small but well crafted. This is an amazing restaurant! Mimosas and sangrias were great as well as the patatas bravas & hanger steak! Spencer was our server, he was great! We had a table for 6 and it was our first time dining here. The food, drinks service and ambience were excellent. My only complaint is that it was seriously loud. I’m not one to typically care about that, but our whole table was basically yelling at one another for conversation. I’d definitely go back though. Maybe sit outside though. Thank you for dining at Bar Mercado! We apologize that the noise was louder than you generally appreciate - and can make a note in your profile that you prefer quieter areas of the restaurant if possible. Please reach out and let me know your name and we can make sure this is reflected going forward. Thank you! Amazing as always. Nate was great and really on it. We didn't even have to ask for much, he just pretty much anticipated our needs and got it for us. Love the food! Will continue to come back! Thank you for the high praise AshleyL! We certainly will pass the feedback on to Nate and hope to welcome you again soon! A good spot for tapas and a cocktail or two! The menu offers vegetarian friendly options aw well. Thank you for joining us MShopper! We hope to welcome you again. Nothing negative to say at all! We went for a birthday and they went above and beyond! The bottomless mimosas and sangria were constantly being filled! And the food was UNREAL! Thank you for sharing this occasion at Bar Mercado! Very disappointed with the food. Ordered 5-6 dishes and every single one was disgusting. Thank you for choosing Bar Mercado and we are disappointed to read that the experience did not live up to your expectations. We would love the opportunity to connect briefly to understand a bit more about what happened. Please let me know how we can connect to discuss in further detail. Great experience. Service was friendly and quick. Food was delicious. Thank you for dining with us at Bar Mercado! The food was amazing! Lots of different spices, each dish very unique. Our service wasn't great, but we will definitely go back! Love the bottomless Sangria! Love this place! Great lively atmosphere, delicious and interesting food, great drinks! Thank you for dining with us AdrienneG! Thank you for spending the evening with us! It was super wack. Have I written 50 characters yet? Zach - I apologize that the experience at Bar Mercado did not meet your expectations. We would love to connect to receive some additional feedback. Please let me know if you would be open to a quick discussion. Thank you! Amazing service and great food! We were met with great attention, respect and timely service. 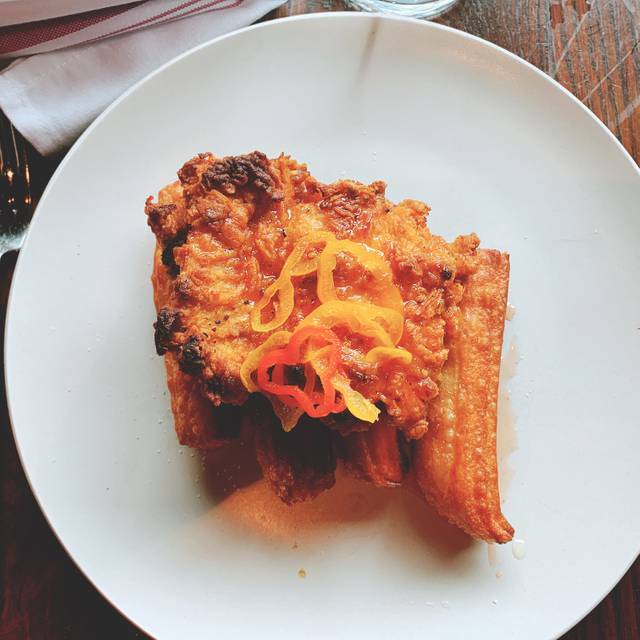 JoeyM - thank you for dining with us at Bar Mercado! The food was so great! We tried a bunch of different things. The ambiance is really nice. There was one extremely loud drinking table next to our valentine's day date for the first half of dinner but thankfully they left, and after that the noise level was just fine. Our server was wonderful however she had way too many tables and kind of left us alone for 17 minutes after all signs that we were finished eating and wanted to go home. It was okay, just annoying. And not her fault, she had at least 6 active tables at that time, so she was very overloaded. The food was just magnificent. I loved everything I tried, and we ordered about 8 different dishes. I will go again! LoveToEat, Thank you for spending the holiday with us! We apologize for the slight mis-step in service and hope we have the chance to welcome you again to prove this was surely an isolated incident. Take care! We were very impressed with the service we received. All of our dishes were unique and very tasty. We will definitely be returning. Thank for spending this occasion with us DierdraB! They put the Bar in Bar Mecardo- great drinks! Service was friendly but it took us forever to get our food at brunch (people around us seemed to get theirs in reasonable time). Food was tasty but cold and rather small portions considering the price. I’d recommend them for a happy hour drink and a tapas, but there are plenty other great brunch spots in Atlanta. Thank you Kino! We are thrilled to read that you enjoyed your drinks. Apologies that the food took longer than anticipated and that the portion sizes didn't meet your expectations. We would love to welcome you back to try brunch again, or for dinner service any day! Let me know if we can connect to make that happen! We never eat at this restuarant before in the Krog Street Marketplace. We passes it many times. A wonderful place for brunch. The menu is awesome and the portions are perfect for brunch. Thank you AtlantaFoodie! 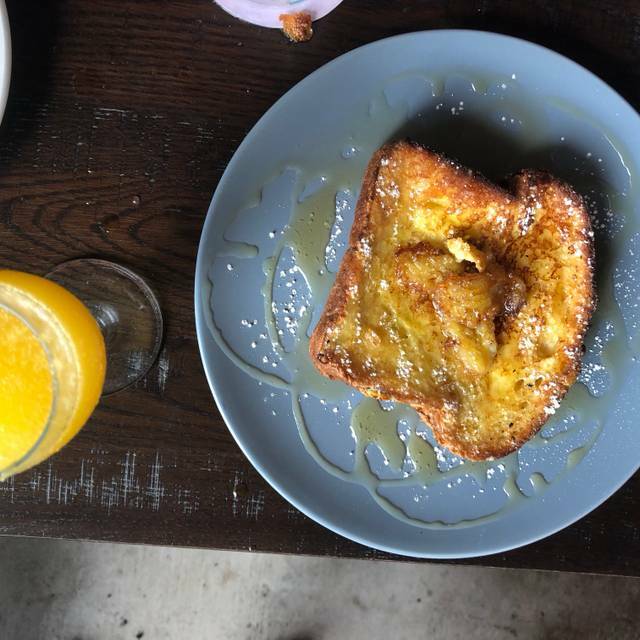 We are excited to read that you enjoyed brunch and hope that you will visit us again! Food was incredible and the staff were exceptional, we sat at a table beside the bar and with a party on the patio it was incredibly crowded and loud. when we got there our table wasn't ready and the staff brought myself and my wife a drink while we waited on our table. Classy touch shows they care about their patrons. Thank you for your patience CDoy - we appreciate you giving us the opportunity to make your evening special. We hope to welcome you back soon.